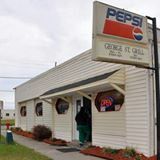 Located on the older industrial side of Goldsboro, but very well known by the locals. Full hot breakfast menu and daily lunch specials. I walked in about 6:30AM one morning and ordered a meal and dined in. They had a pill of bacon, sausage, smoked sausage and biscuits. I thought to myself they look like they are planning for a busy day. While I was eating the door never stopped. Person after person coming in and getting a breakfast to go. Food was great! If you are looking for a fancy building and decor, that’s not them, but the food is great, ask any local!